Most of us who work in laboratories have seen the safety videos that are a precondition of our employment. You know, the ones where an addled slacker commits the sum total of humankind’s follies in six and a half minutes, and we roll our eyes and think, “Yeah, that doesn’t happen.” Well, maybe not exactly, but the consequences can be dire when anything does go wrong. Regardless, if we feel safe laughing at Scooter for doing things like reheating his latte on a fume hood stir plate, then a bit of a lecture is in order. Scooter’s travails would have been no balm to the eminent chemistry professor John Patten Emmet, whose early demise at age 47 was certainly hastened by a long series of chemical mishaps that once included his assistant inadvertently throwing an uncapped flask of sulfuric acid at him. Dr. Emmet was hired by Thomas Jefferson in 1825 at the University of Virginia to fulfill the Enlightenment ideal of placing inquiry front and center in university education. This initiated a novel course of study in which students conducted their own experiments. Commensurate with this ideal, the iconic Rotunda broke with academic tradition and incorporated a library instead of a chapel. It also housed a working chemistry lab, which was recently rediscovered behind a wall during a restoration project. The space contained remnants of Dr. Emmet’s chemical hearth, with brick fireboxes surrounded by vents and flues to draw off heat and toxic vapors. In other words, he created a fume hood; a rudimentary one, but effective enough that Thomas Edison later adapted similar designs incorporating the chimney in his own laboratory. The University of Leeds developed the first bona fide fume hood in 1923, consisting of a cabinet at working height with a sash window that could be raised or lowered. Labconco offered the first commercial fume hoods in 1936, and innovations over the next half century included variable exhaust control, which allowed constant face velocity of airflow, and shifts in building materials away from wood to fiberglass and coated steel, allowing greater durability and resistance to fire and corrosion. Regulatory standards were introduced in 1996, and now, a chemical fume hood at minimum consists of a working cabinet with a moveable sash. It must be capable of maintaining constant airflow through an exhaust system connected via building ductwork to allow venting of fumes and vapors to the outside. Beyond that, there are many variations, and users should above all be aware of which type of hood they are preparing to work with and whether it is appropriate for the work they are planning. To begin with, a fume hood is not the same as a biological safety cabinet (BSC). Fume hoods use ventilation and exhaust to protect the user and environment from chemical vapors, while BSCs employ HEPA filters to protect users and samples from contamination. To readers, this may be obvious, but perhaps it is less so to new students. Mistaking the BSC for a fume hood and opening a noxious substance like beta-mercaptoethanol floods the room with the smell of rotten eggs, and everybody has to leave. There are a wide variety of fume hoods and an array of strategies for their proper use. There is also an active field of study with its own controversies about which apparatuses and settings are best for sensitive applications. Notably, the handling of radiolabeled isotopes in the production of diagnostic pharmaceuticals and the manipulation of engineered nanomaterials are subject to various rates of leakage into the ambient air, depending on variables such as face velocity, sash height, and temperature. Additionally, there are significant cost, energy, and regulatory concerns: A laboratory space is required to maintain a certain air exchange rate that must factor in constantly running fume hoods. 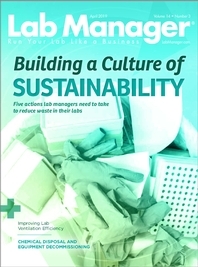 Costs can exceed tens of thousands of dollars for a single laboratory, and the energy footprint of fume hoods is perhaps the most significant single factor in making laboratory buildings four to five times more costly than comparable office space. Although variable air volume hoods have mitigated some long-term costs by allowing sashes to be closed when not in use, their implementation is not universal. Depending on the focus of a given laboratory, users may encounter a wide variety of air exchange designs with intrinsic capabilities and limitations. With these caveats, there is a basic, unequivocal list of fume hood best practices that all researchers should follow, as outlined next. Determine the hood’s purpose and whether its capabilities are appropriate for the work to be done. Check active hood performance indicators against survey stickers to make sure it is within 20 percent of optimal range. Safety inspections completed according to the periodic schedule set by the relevant Environmental Health and Safety staff. Parts regularly updated and upgraded. Face velocity measured and compared with the manufacturer’s recommended range, using averaged values from an anemometer. All work should take place at least six inches beyond the front airfoil of the hood, with a strip of tape to demarcate the boundary and with the sash less than 18 inches open. Equipment that resides within the hood should be placed along the sides rather than at the front or back, ideally on perforated shelving, to avoid restricting or disturbing airflow through vents and airfoils. Electrical equipment should be connected outside the hood to avoid arcing and sparking. Use of the hood as a storage cabinet should be strenuously avoided, with reagent and waste containers placed in secondary containment to avoid disastrous spills. Personal protective equipment should be worn at all times, including lab coat, gloves, safety glasses, and closed-toe shoes. Avoid sudden and demonstrative movements around the hood, which can create turbulent airflow and dangerous fluctuations in face velocity.